During his visit to Erbil, Cardinal Vincent joined Archbishop Bashar Warda and the Chaldean community in the celebration of Mass in the Cathedral of St Joseph on Sunday 12 April, marked as the 'First Sunday' in the Chaldean calendar. The Cardinal expressed his gratitude for the warm welcome he had received and his admiration for the courage shown by so many people who, in recent months, had lost everything except their family love and their faith. He also thanked the Chaldean Community in Erbil for the admirable and effective welcome they had given, under the leadership of their Archbishop, to so many thousands of displaced people. 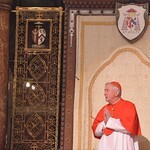 Additional photos of the Cardinal's visit to Erbil can be found here.